Pat Byrnes worked at home and made his own hours. His wife's job (Illinois Attorney General) was not so flexible. So when the first baby came, he naively volunteered to go where few men have gone before and stay home with the kids. On one condition. He wouldn't be called Mr. Mom, but . 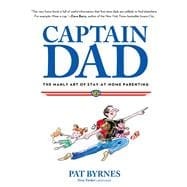 . . Captain Dad. Byrnes has collected his insights in the first book about stay-at-home fatherhood by a professional humorist who has lived the part. He reports on the front lines of modern parenting, tackling all of the expected subjects, like sleep deprivation and the constant battle against Disney for your child's affections. But he also covers the less expected, more random moments on the job and the surprising insights they offer. From the absurd pride that comes from being able to change a diaper almost anywhere to the surprising talent you develop for improvising answers to Life's Most Important Questions, such as "Why is bird poop white?" With wit, pith, and vinegar, Byrnes examines this hitherto unexamined lifeand finds it worth living. Pat Byrnes is a cartoonist and a regular contributor to The New Yorker. He is the author of What Would Satan Do? and Because I’m the Child Here and I Said So. For three years, he created the syndicated comic strip, “Monkeyhouse.” He lives in Chicago, Illinois.